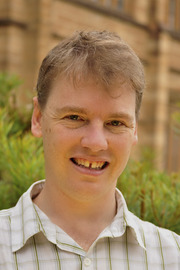 Toby Hudson is a Senior Lecturer in Theoretical Materials Chemistry in the School of Chemistry at the University of Sydney. In 2008 he completed a Sydney University Postdoctoral fellowship. His D.Phil. was in Materials Science at the University of Oxford in 2000-2004, modelling neutron damage in metals for fusion reactors, and he continued at the Oxford Materials Modelling Laboratory for a postdoctoral year studying silicon nitride crystal interfaces. His undergraduate degree was a B.Sc.(Adv.) at the University of Sydney, majoring in chemistry and physics, with an honours year in computational chemistry (class 1 and university medal).